Neil Ramirez. Jeff Beliveau. Evan Marshall. These are three pitchers who weren’t on anyone’s radar two months ago, but are also being depended on to help navigate the Cleveland Indians through their early-season bullpen woes. If that doesn’t tell you how bad things are with this team’s relievers, nothing will. Unfortunately, there’s a good chance this situation doesn’t change anytime soon. The issues with Cleveland’s bullpen have been well documented to this point. It feels impossible to keep track of how many losses can be attributed to the team’s relievers melting down on the mound. Last night’s game against the Houston Astros – which featured the bullpen turning a 4-2 deficit into an 8-2 loss – was yet another example on a growing list of flops from the pen. At this point, only two relief pitchers – Andrew Miller and Cody Allen – have been able to log eight or more appearances and still maintain an ERA below 5.00. This, of course, will force Cleveland to over-rely on them and risk wearing their arms down by the time the postseason comes along. It is, in no uncertain terms, a mess. No lead the Indians offense can build feels safe, no call to the bullpen is seen by fans as reassuring. The solution seems obvious to those of us watching – hit the trade market. If the relievers on the roster aren’t cutting it, it’s time for the front office to pick up the phone and make a deal or two to fix this problem. Unfortunately, there are a few factors which make this more complicated than it seems, and might lead to this team enduring more weeks of bullpen hell. For one, despite the Indians boasting an underwhelming 24-24 record, they still inexplicably sit atop the AL Central standings. This, obviously, is a testament to how awful the rest of the division is. However, Cleveland’s spot in first may make the front office a little more hesitant to pull the trigger on trades. If there was another club threatening to run away with the Central, the Tribe might feel compelled to address the putrid bullpen now. However, since the Indians are still comfortably (?) in first place despite a relief corps which would barely cut it in a beer league, the front office might feel a sense of patience. One would assume the team is at the very least kicking the tires on some potential trade targets, just to do its due diligence. However, with the season being just two months old, most clubs might not feel ready to make any sort of moves yet. Sure, there are more than a few clubs which can already kiss their postseason dreams goodbye. At the same time, the desire to start shedding parts typically isn’t very high this early in the season. Trade offers will only get more enticing as the deadline nears, so why pull the trigger now? That doesn’t mean a deal can’t be made, though. However, this leads to another complication in Cleveland’s attempt to fix the bullpen now. Since teams aren’t feeling any sort of pressure to make trades, there’s no need to accept bad or even fair offers. Any club the Indians call has more than enough time to sit back and weigh its options. Making matters worse, Cleveland’s situation is apparent to everyone watching. Every other club knows how desperate the Tribe is to fix its bullpen. As a result, it wouldn’t be surprising if a team tried to force Cleveland to overpay for relief help. As bad as this bullpen is, nobody wants to see the Indians fix it by getting fleeced in an uneven trade. Those begging the front office to stop sitting on its hands aren’t going to feel any sense of relief if bullpen help comes via dealing a prized prospect two months into the season. So, as difficult as it is to watch these relievers, we might have to endure it for a little while longer. 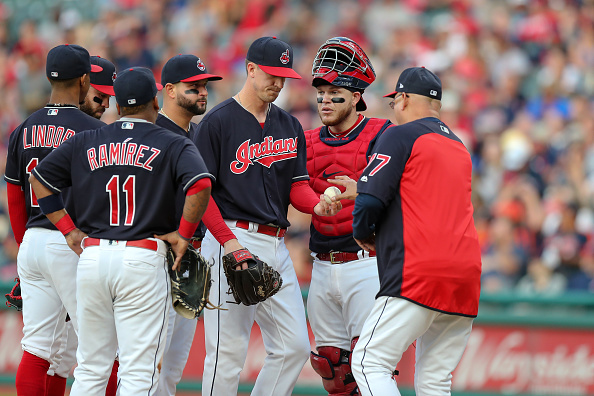 The bullpen may be derailing any chance for the Indians to get out of their funk, but current circumstances make it difficult to trade for any help. For now, we have to take the same approach the team is – hope one of these call-up relievers becomes reliable and pray Miller and Allen’s arms don’t fall off.